New data from the 2018 Campus Computing Survey highlight the compounding consequences of both annual IT budget cuts and mid-year budget reductions on campus IT organizations – and by extension, campus technology resources and services. Fully two-thirds (68 percent) of the fall 2018 survey participants report that campus IT funding has not recovered from the recurring budget cuts that began for most institutions with the “Great Recession” in fall 2008. The fall 2018 data mirror the numbers in past years. In fact, the percentage of institutions reporting formal IT assessment initiatives has dropped over the past decade from 21 percent in 2007 (in the wake of the Spellings Commission) to 16 percent in fall 2018. “The reality is that while institutions and academic programs make significant investments in IT resources to support instruction, comparatively few campuses have sustained institutional initiatives to assess the impact of these efforts on student learning and institutional outcomes,” notes Green. “Part of the challenge is that the academic initiatives are often programmatic or centered in academic departments, and are perhaps championed by a few faculty members who see an opportunity leverage IT and digital curricular resources to enhance courses and improve the learning experience. But in too many circumstances the formal assessment of these initiatives may be an afterthought or unfunded expense.” Absent any assessment, faculty and campus officials are left with either opinion or epiphany, rather than evidence, about the impact of these efforts. This year IT security emerged as the top IT priority for IT leadership, followed by hiring and retaining IT talent. Leveraging IT to support student success initiatives ranked third, followed by assisting faculty with the instructional integration of IT. These four issues have been among the top five IT priorities in the annual Campus Computing survey for the past several years. Interestingly, analytics is a newcomer to the Top Five IT priority list for fall 2018. The 2018 data highlight what can only be described as the continuing “organization churn” in many campus IT units. Just under half of the participating institutions reported a reorganization of the central IT unit in the past two years. A similar number expect a reorganization in the next two years. Yet what is truly striking is that a third (31 percent) of the IT units that recently reorganized expect to do so again in the next 24 months. The churn may be attributed to several factors such budget cuts (leading to the consolidation of various units) or major personnel changes in IT or institutional leadership. 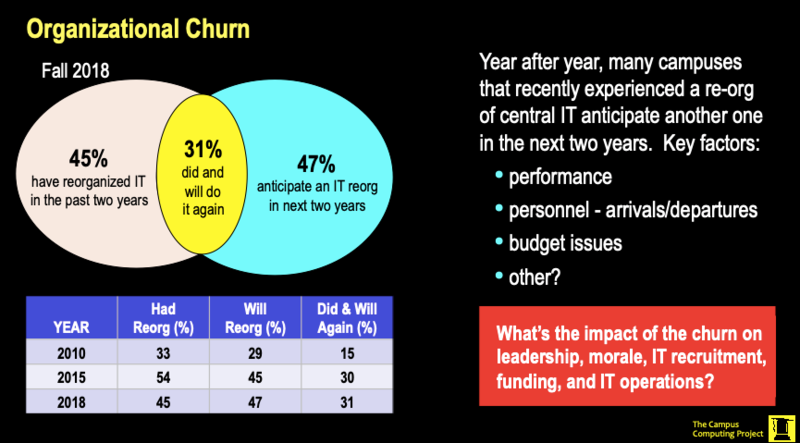 Still, the trend data showing significant IT reorg activity in both good and difficult economic times suggest that the churn may almost be a structural aspect of life in campus IT units (and for IT leadership). The fall 2018 survey data document rising institutional support for OER (Open Educational Resources) curricular resources: almost two-thirds (64 percent) of the participating institutions report campus efforts to “encourage faculty to use OER content for their courses,” up from 34 percent in 2014. And over half the survey participants report their institution also provides some support for faculty to develop OER content. Given the rising concern about college costs and course materials, the concurrent rising support for OER is not surprising: campuses that encourage faculty to select OER materials can cite these efforts as part of institutional efforts to address college costs. Yet the survey data also suggest that faculty are concerned about the quality of OER materials compared to commercial curricular products: only two-fifths (38 percent) of the survey participants report that their faculty view OER textbooks and curricular materials as comparable in quality to commercial resources. While other recent surveys confirm that faculty are cost conscious about course materials, many faculty may view institutional efforts to promote OER as a challenge to the professorial prerogative to select text books and other course resources. The hurricanes that wrecked many communities in recent years serve as a recurring reminder that colleges and universities should view IT disaster recovery as an essential task. Yet survey data dating back to the years following Hurricane Katrina, which devastated New Orleans in 2005, reveal that a significant number of institutions do not have current IT disaster plans. Almost a third (31 percent) of the institutions participating in the fall 2018 survey have not updated their IT disaster plans in the past 24 months. “More than a decade after Katrina and the many storms that have followed, I remain surprised by the number of institutions that have not updated their IT disaster plans. This is truly an example of when, not if,” says Green. The 2018 survey suggests rising recognition of the impending role of Artificial Intelligence (AI) in analytics and AI and Artificial Reality (AR/VR) in instruction. Two-fifths (42 percent) of the survey participants believe that will be an “important resource for analytics in the coming years, up from 30 percent in 2017. In contrast, just under a third (30 percent) anticipate that AI will play an important role in instruction in the next few years (up from 19 percent last year). The numbers for AR/VR in instruction are some similar: 26 percent in fall 2018 vs. 20 percent a year ago. The 2018 Campus Computing Survey is based on data provided by senior campus IT officials, typically, the CIO, CTO, or other senior campus IT officer, representing 242 two- and four-year public and private/non-profit colleges and universities across the United States. Survey respondents completed the online questionnaire between September 20 and October 24, 2018.